I thought I would post this photo of the WW I veterans from Mt. Lookout. Seems the least I can do for old War Heroes. From what little information I can find I believe this photo is from 1917. The tall guy third from the left in the back is my grandfather, George Wesley Kincaid. 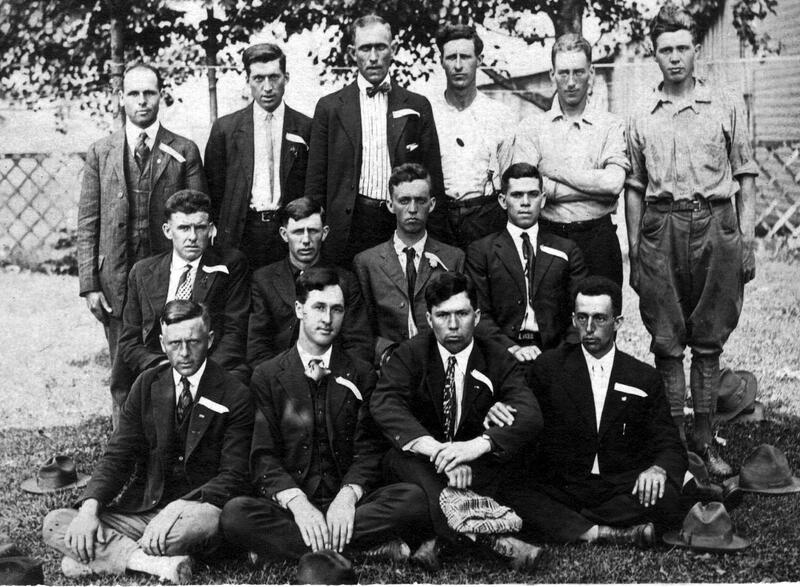 2nd Row: Charles Shaffer, Crosby McClung, William Murray Johns, Arthur Amick. Back Row: Z.B. McClung, Emory Underwood, G.W. Kincaid, Frank Johns, C.S. McClung, Alex Hendrickson. If you have anything you would like to add, please let me know. Update: A big thanks to Loretta Legg and Tom Legg for pointing out my missing name. William Murray Johns was the name that was missing from the second row. He is the one you did not have a name for, one in 2nd row third from left.